Fibroids are connective tissue growths that develop from the muscular wall of the uterus or cervix. They may be found in the wall itself, under the external lining of the wall, or they can bulge into the cavity of the uterus. Fibroids are a common finding in women over 35 years of age and are more common in Afro-Caribbean women. What kind of growth is a fibroid? Fibroids are benign growths composed of connective tissue and muscle. They can grow and shrink under the influence of female hormones. The number and size of fibroids can vary enormously. Fibroids usually become very small after the menopause. 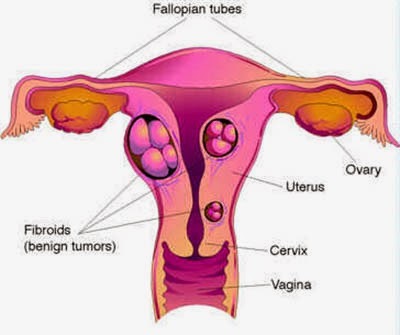 Cancerous change in a fibroid is very rare. · Many women are unaware that they have fibroids because they do not have any symptoms. · Painful periods or irregular periods. · Fibroids may also cause discomfort through pressure on the bowel or the bladder since both these organs lie close to the uterus.